Above: Gov. 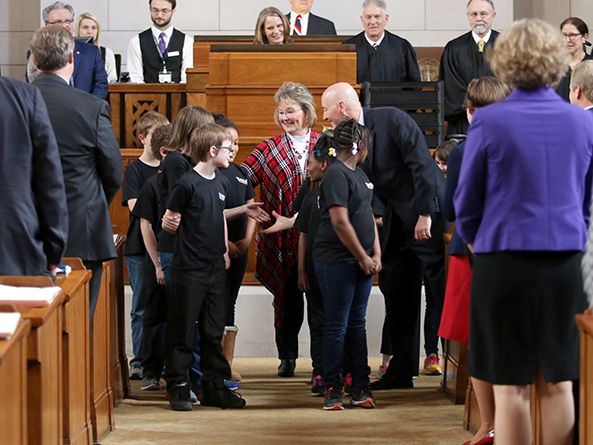 Pete Ricketts greets members of Lincoln’s Everett Elementary Chorus after they performed a rendition of “Happy Birthday” to Nebraska. The Legislature celebrated Nebraska’s sesquicentennial with a ceremony in the George W. Norris Legislative Chamber March 1. Officials from the executive and judicial branches of state government joined senators in the celebration, which included vocal performances, a poetry reading and a recitation by Secretary of State John Gale of the proclamation, signed March 1, 1867, by President Andrew Johnson, which made Nebraska the 37th state in the Union. Gov. Pete Ricketts opened the ceremony by remembering the Native Americans, explorers and immigrants who endured hardship and persecution to build Nebraska into what it is today. Living in Nebraska has always required courage, determination, perseverance and a willingness to work together to solve common problems, he said. Ricketts then signed a proclamation declaring March 1 as Statehood Day in Nebraska. Nebraska Supreme Court Chief Justice Michael Heavican said that, throughout the state’s history, Nebraska courts have helped uphold the state motto: equality before the law. Nebraska State Poet Twyla Hansen read her poem “Nebraska, a Treasured State,” whose three stanzas focus on the state’s natural resources. She said the poem is inspired by works of art in the Capitol, including mosaics, murals and the Sower. Hansen dedicated the poem to her grandparents, who settled in Burr County in the late 1800s after immigrating from Denmark. The celebration was part of a full day of activities at the Capitol and the Nebraska History Museum to commemorate the anniversary. The U.S. Postal Service issued a new stamp depicting sandhill cranes flying low over the banks of the Platte River. Actors portraying Willa Cather, Chief Standing Bear and Buffalo Bill Cody gave performances in the rotunda and riders with the National Pony Express Association delivered the original statehood proclamation to the governor after parading their horses in the streets around the Capitol. Finally, the Nebraska History Museum opened an exhibit featuring oil paintings depicting scenes from each county. Norfolk Sen. Jim Scheer, speaker of the Legislature, said Nebraskans’ desire for public access to elected officials and transparency in the legislative process is manifested in the state’s unicameral Legislature. George Norris, a U.S. Senator and congressman from Nebraska who was instrumental in converting the state’s legislature to a one-house system in the 1930s, believed that a unicameral system emphasized that all citizens are of one class, Scheer said. “Today, our Unicameral is arguably the most efficient and transparent legislative branch in existence,” he said. Norris viewed Nebraska as one community, not a divided state, the speaker added. Norris fought for the fair and equal representation of all interests, Scheer said, an ideal the Legislature still upholds today. Scheer said all senators should focus on the common goal of making the state better and protecting it for future generations.